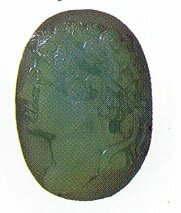 Chrysoprase is a translucent, apple-green stone, is the most valuable variety of chalcedony (family). The color is derived from the presence of Nickel. Its composition is Silicon dioxide and hardness is 7 in the Moh’s scale. Chrysoprase is an excellent balancer of both physical and mental body. It steadily emits a serene flow of light, which has a sedative and tranquilizing effect on the wearer. It seems to clarify problems, bringing unconscious thoughts to a conscious level, as well as helping develop a higher consciousness and strengthening inner vision.